True Confession: For me, Facebook was love at first post. Apparently I am not alone. Facebook reigns as Social Media King, with 750 million active users. Here are a dozen reasons why Facebook is this writer’s Social Networking BFF. 1. Cure for Isolation: I am a relational gal and it is no secret that writing can be an isolating business. Facebook is a 24 Hour Kitchen Table “Come and Go” Conversation that never ends. I can connect to other writers who are also trapped at home on a deadline. In fact, Facebook is a virtual water cooler for thousands who work at home in their PJs but enjoy a little human connection with their coffee break. 2. Primes My Writing Pump: I read Facebook the way some read the morning paper (before newspapers all but disappeared). I like to peruse my friends’ thoughts while I sip my coffee. Writing a comment here, a question there, gets my writer’s juices flowing. Before long I fill in my status, which is much less daunting than writing a first sentence on an empty page. Interacting on Facebook eases me into a writing frame of mind. 3. Testing Material: Since I write humor, Facebook is a great place to test comedic material. If I get lots of good comments, I cut and past the post into a “Humor File” to use later in a blog or book. 4. Finding Topics that Hit a Nerve: Recently my daughter wrote a FB status about the pros and cons of when to share news of a pregnancy. More than 300 passionate responses from readers later, Rachel knew she’d stumbled upon a hot topic for her blog (www.thenourishedmama.com). 5. Easy Daily Journal: Everyone knows writers should journal daily. But what with all the social media we are now required to do to build our platform, who has time to journal, too? It’s a comfort to me that I have recorded the highlights of my experiences in a brief (publicly read) journal over the last 5 years… on Facebook. Romance novelist Eloisa James wrote an entire memoir (Paris in Love) based on a year of Facebook posts! Because the posts were so well-written, to my surprise, the book was hard to put down. 6. Gathering Ideas from Readers: In her bestselling book The Happiness Project, Gretchen Rubin sprinkles short tips and thoughts from her blog readers’ comments throughout the book. This added interest and variety to her book, especially when presented in bullet-point format. 7. Finding Original Quotes, Quips, and Anecdotes From Others: I wrote a couple of Facebook posts during a vacation when my husband and I both caught the flu. An author friend, writing a book on marriage, asked if she could use my posts as anecdotal material. I was happy to share; and she was gracious to attribute the quotes to me and mention my latest books as a reference in her book. A win-win! 9. Facebook Friends are Faithful Fans: I’ve discovered Facebook friends to be faithful supporters of my blogs and books, generous in helping get the word out by re-posting press releases, book sales, and good reviews. 10. Networking: You never know how a Facebook relationship can lead to opportunities for writing or marketing your book. My daughter struck up a friendship with another prolific blogger who asked Rachel to guest post for a popular teacher’s blog. Rachel did so well that she was offered a paying gig to write regularly for http://www.weareteachers.com. We’ve also landed radio, podcast, and other web interviews because someone in media saw and liked our posts, blogs, or book topic on Facebook. 11. Random Polls: In our upcoming book Nourished: A Search for Health, Happiness and a Full Night’s Sleep (Zondervan, January 2015), my daughter (and co-author) wanted to address the Top 10 Everyday Stressors Women Face. So I posted the question, “What are the daily things that slow you down, trip you up, and steal your peace?” We gathered dozens of replies and categorized them into 10 areas that formed the basis for an entire book. 12. A Word for the Weary: How often have I received the perfect word of encouragement, comfort, or advice from someone on Facebook, exactly when I needed it? I’ve also had the privilege of regularly encouraging others via Facebook. For those who welcome it, Facebook connections can be a true ministry of words, whether or not you are professionally published. How have you used Facebook to reach your readers? This entry was posted in Encouragement, Marketing and Promotion, Social Media, Writer's Life, Writing, Writing Craft and tagged Facebook, Social Media, social media marketing, social media networking, social media platform by Becky Johnson. Bookmark the permalink. 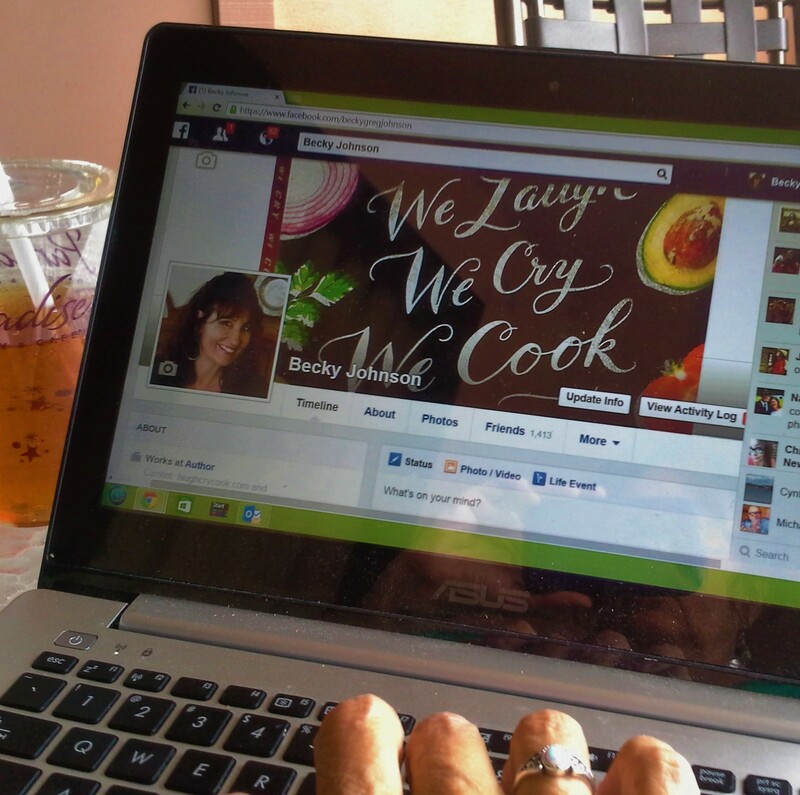 Becky Johnson is an author and blogger along with her daughter Rachel at www.laughcrycook.com. Their newest book, an enlightening and humorous journey about self-care is titled Nourished: A Search for Health, Happiness and a Full Night's Sleep (January 2015, Zondervan). They also authored We Laugh,We Cry, We Cook, a humorous food memoir, in 2013. SUPER post, my like-minded friend. I need a Becky visit in the worst way (and FYI, I’m saving this one to read and reread. Great reminders all. Shellie, that made my day! Thank you so much. And I am in the same bad way…. needing a Shellie visit! I love writing on Facebook, too. In fact, I’m pretty sure that was what attracted me to it in the first place. I do find, however, that it can take too much of my personal writing time from more productive projects. LIz, that IS an issue, for sure, for most of us who love this social network! Some of my “face-to-face” friends act like they are too cool and busy for Facebook or any social media. But I agree with you–it’s a GREAT social outlet for me. My son still tells me I need to find some “real” friends, not just my online friends. My response, “WHAT’S WRONG WITH SPENDING TIME WITH MY ONLINE FRIENDS?” So there … whew! What a relief! I’m glad I finally said it! Write on, Facebook friend!